You are currently browsing the tag archive for the ‘the Sivan Temple atop Bukit Gasing’ tag. 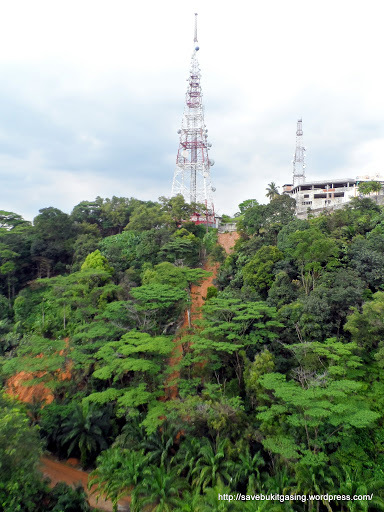 FIFTY plots of vacant bungalow land in Bukit Gasing will be seized under the National Land Code 1965 (NLC 1965) and gazetted as a forest reserve following multiple landslips. Petaling Jaya City Council (MBPJ), following expert advice from geotechnical, civil and structural consultants, will prepare a detailed report on the vacant land that has been classified as Class 4, (slopes with a 25 and 35 degree gradient) and a possible hazard, built or left idle. Mayor Datin Paduka Alinah Ahmad said the council would propose to the Selangor Economic Action Council that the vacant plots with steep slopes be acquired under the NLC to address safety concerns due to extreme soil erosion. “MBPJ will inform owners that their plots will be seized due to public interest. Since it has been classified as Class 4, the land cannot be occupied and no development will be allowed. 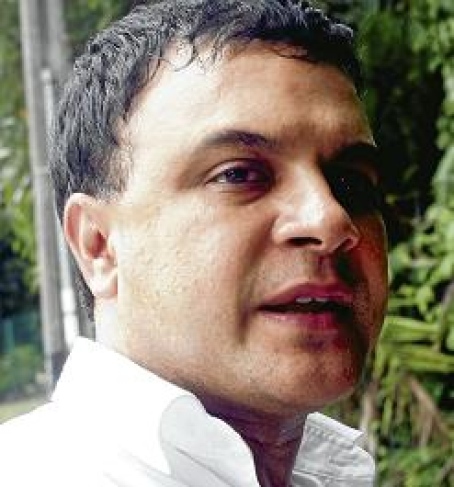 “The NLC has provisions allowing the state government to seize neglected land,” said Alinah. The NLC, together with the Land Acquisition Act (LAA) 1960, empower the respective state governments to acquire private landed properties without having to get consent or agreement from its owners. This is stated in Section 3 of the LAA 1960. The move by MBPJ is a blow to market speculators and landowners who had hoped land value would increase manifold due to shortage of land in Petaling Jaya. In April 2008, the Selangor government banned new developments involving Class 3 and Class 4. Alinah said the landslips had occurred at 20 different sites near Bukit Gasing and said this could be due to development works in Bukit Gasing as well as downpours that triggered the landslips. “MBPJ is left with not much option but to take drastic action. Based on the soil erosion, the plots affected are off Jalan 5/60, Jalan 5/64 and Jalan 5/66,” said Alinah. She added that the council had engaged soil experts to ascertain erosion-prone areas which are dangerous. “We have informed the residents of Fraser Towers not to park their cars at the foot of the slopes. Recently, a boulder rolled down and hit a parked car while in another incident, mud and vegetation rolled down the slope and hit a car being driven along Jalan 5/60. “Inspection by geotechnical engineers, who can recognise impending slope failure, is being carried out. As an immediate short-term measure, a gabion wall is being built. This is a better option than nail piling. “Contractors have also started to prune some of the trees on the slope, remove mud that was washed down close to the pavement as well as widen the drain along Jalan 5/60 from a V-shape to a U-shape,” she said. Alinah added that the landslip close to Fraser Towers was due to a defective scupper drain that runs along the Sivan Temple located on the hill. She said water in the drain backflowed and as such flooded the slope, causing it to be water logged. “Our contractors are repairing the drain and consultants have suggested that the slopes be re-profiled to create a gentler gradient. “However, this can only be done once the slope stabilises on its own, with no soil movement,” she said. Alinah said development in and around Bukit Gasing or above SMK Taman Petaling would not be allowed. 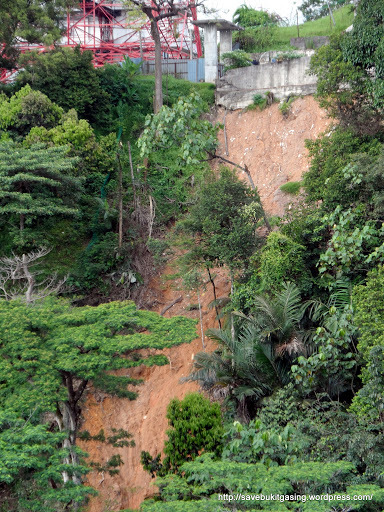 RESIDENTS in Cameron Towers, Bukit Gasing are living in fear of more landslips in the area in view of the rainy season. The landslip that occurred on May 3 had shocked the residents, with subsequent landslips along Jalan 5/60 and Jalan 5/64 last week, adding to their fear. Mary Lim, a housewife, said every time it rained, she kept a lookout on the hill, which is opposite her condominium. “The hill is also very close to our swimming pool. What if there is a landslide when there are people using the pool?” asked the distraught resident. 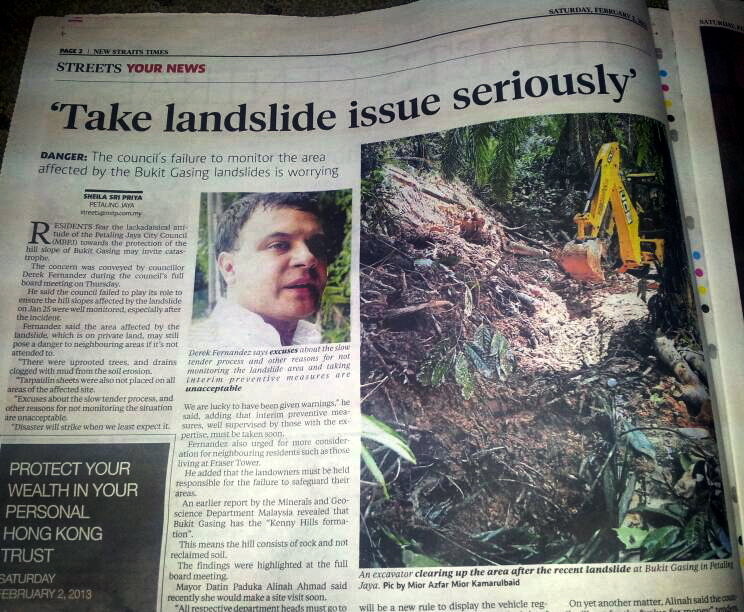 Cameron Towers Joint Management Body treasurer Jim Khong expressed concern over the recent landslips in Bukit Gasing. 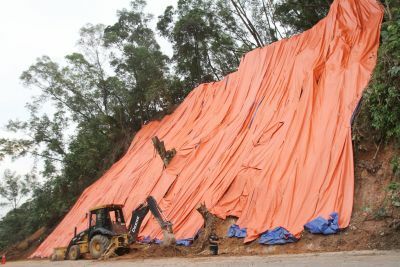 “We fear that if a landslide occurs on Bukit Gasing, it will affect residents in the area as there is a water reservoir on top of the hill,” he said. Khong said the residents want the Petaling Jaya City Council (MBPJ) and Kuala Lumpur City Hall (DBKL) to work together as the hill is situated on the border of Petaling Jaya and Kuala Lumpur. The building manager, Lee Lai, said they had written to MBPJ after the landslips and that an officer from the council’s infrastructure and engineering department had visited the site. “He took photos of the landslip and said they would discuss the situation,” Lee said, adding that residents wanted immediate action to be taken to resolve the problem. 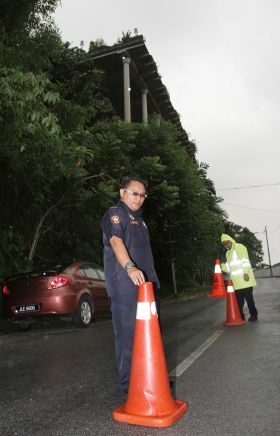 PETALING Jaya City Council (MBPJ) workers were kept busy clearing broken tree branches and debris on Jalan 5/60 and 5/64 in Bukit Gasing yesterday morning following a downpour on Tuesday night. 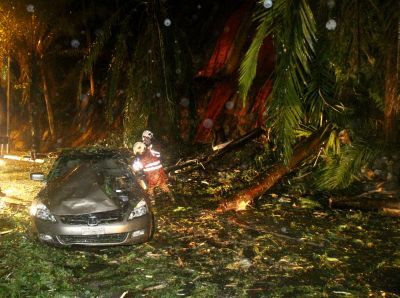 MBPJ personnel from the council’s Quick Response Team as well as Fire and Rescue Department personnel were on hand to help clear the roads. The landslip is the latest to occur, after a similar incident in Jalan 5/64 on Sunday afternoon. Nearer to Fraser Tower, contractors were seen cutting an uprooted tree which had fallen and damaged a resident’s car on Tuesday night as she was driving back to her condominium. MBPJ Engineering Department deputy director Abdul Shukor Mohamed Noor and slope consultants engaged by the council to find ways to strengthen the slope also visited the site yesterday morning to assess the situation. 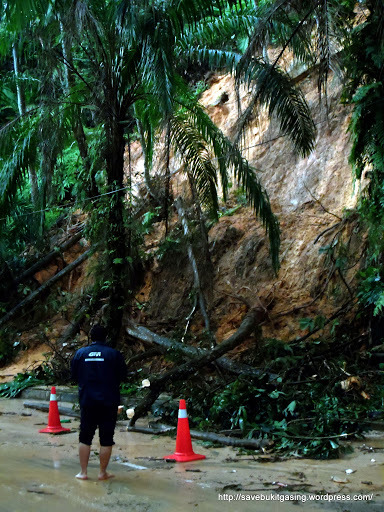 Council public relations officer Zainun Zakaria said a preliminary study on May 6 found that the slope failure area covered 1,625 sq m, and was due to soil erosion. Among the possible causes of the slope failure was the sloping topography and constant heavy rain. “We have put in place short-term measures, such as clearing trees and undergrowth at the affected area and near drains, as well as placing tarpaulin on the surface to prevent erosion,” said Zainun. In addition, a contractor has been hired to build a gabion wall along Jalan 5/60, measuring two to three metres in height, to prevent mud flow. The uprooted tree, blocking the roads was also cut up and removed. Zainun said the council would be using the prism method to monitor soil movement. For the long-term, however, a soil nailing system, together with a beam grid, will be used to create a berm along the slope. Additionally, the drainage system near the slope will also be upgraded to reduce water seeping into the soil. “The contractor for the soil nailing project also just received his letter of appointment today, and will start clearance work as soon as possible to prevent further mishaps,” said Zainun. The contractor has been given seven months to complete the project. 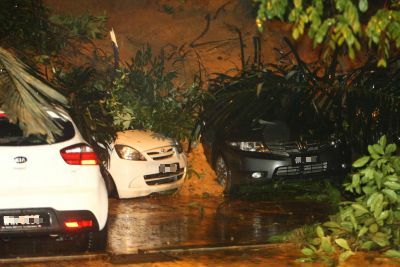 KUALA LUMPUR: A landslide buried nine cars at a car park along Jalan Ampang, near the Jalan Dang Wangi intersection. No casualties or injuries occurred as the cars were parked. Reports indicate that the area is still unstable as soil movement can still be seen. Parts of Jalan Ampang near the scene have been closed to traffic. Earlier, Twitter users were reporting a landslide in front of the Dang Wangi LRT station near Bukit Nanas in Kuala Lumpur. Some motorists were tweeting that a number of cars had been buried by the landslide. 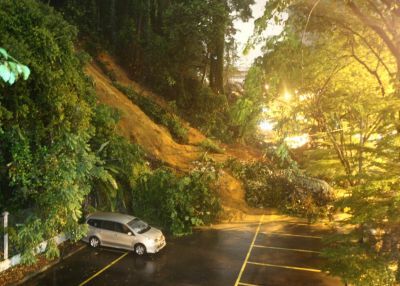 User ‏@Preez_bridabel tweeted; “Landslide at bukit nenas due to heavy rain, I was on my way to Dang Wangi Lrt station..please drive safe”. Another user, ‏@Pijoel94 tweeted, “Tanah Runtuh di Hadapan Stesen LRT Dang Wangi. Banyak kereta tertimbus (Landlside in front of LRT Dang Wangi. Many cars covered)”. 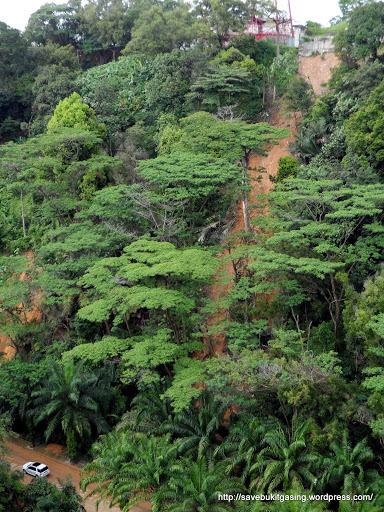 Over in PETALING JAYA, a woman narrowly escaped with her life after a landslip in Bukit Gasing caused a tree to fall on her car while she was driving home. Shanthi Kanthaswamy, 48, was driving along Jalan 5/60 during heavy rain on Tuesday night when the tree fell on the bonnet of her Honda Accord, badly damaging the engine. “I was driving home at about 8.15pm when I heard rumbling sounds on my left and a tree came crashing down in front of me. “Luckily I was driving very slowly, or else the impact could have been worse and I could have been thrown off the road. “I am thankful to have escaped with my life,” said a visibly shaken Shanthi. Fraser Towers joint management body chairman Mohd Kamar, said residents in the area had been complaining about landslips in the area for years. “We have been fighting this issue for more than five years, trying to get the authorities to solve the problem but not enough has been done. “It is endangering the lives of the residents,” he said. 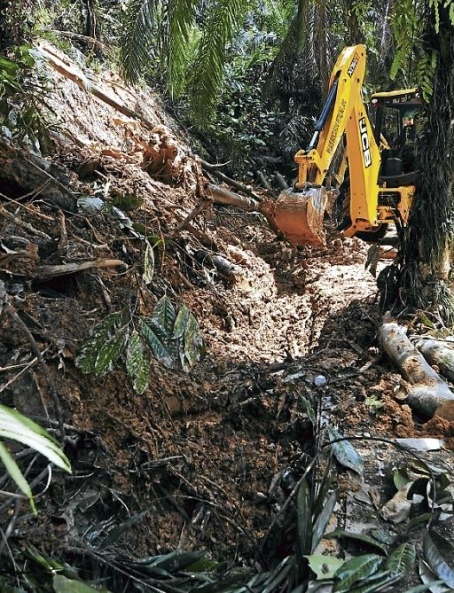 Bukit Gasing’s newly-elected state assemblyman Rajiv Risyakaran said that he would help to expedite efforts to prevent further landslips from occurring in the area. “I am told that the slopes where the landslips are happening is on privately-owned land, and I hope that the owner will take responsibility for it. “In the meantime, I urge the Petaling Jaya City Council to speed up works,” he said, adding that he had met mayor Datin Paduka Alinah Ahmad earlier to discuss the issues in Bukit Gasing. 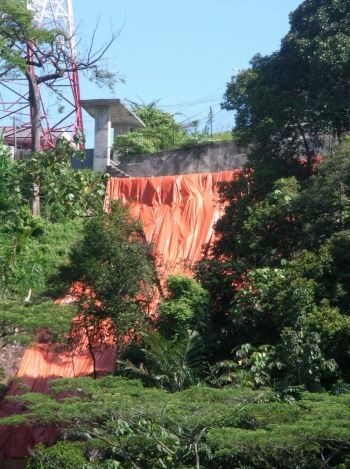 Red zone: Tarpaulin sheets placed over the landslip area at Bukit Gasing close to the entrance of Sivan Temple. 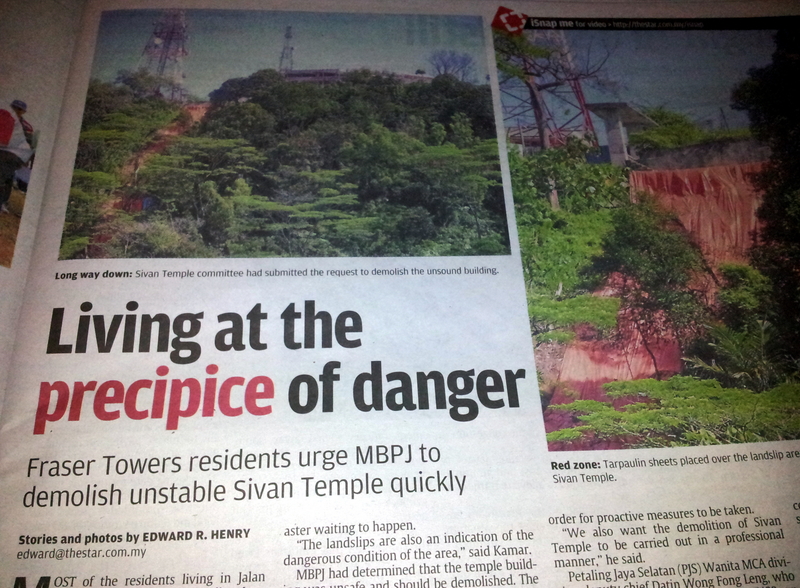 MOST of the residents living in Jalan Gasing’s Fraser Towers, Petaling Jaya want the Petaling Jaya City Council (MBPJ) to demolish the nearby Sivan Temple based on the council’s report, which states that the building was unsafe. The report also said the building could come crashing down during a downpour. The residents are afraid of the danger it poses to their lives and properties, as well as SMK (P) Taman Petaling, also in Section 5. The school is a stone’s throw away from the apartments. Fraser Towers Joint Management Body chairman M. Kamar said the steep slope, sparse vegetation, water-logged conditions and developments on the hill were some of the factors that were worrying them. 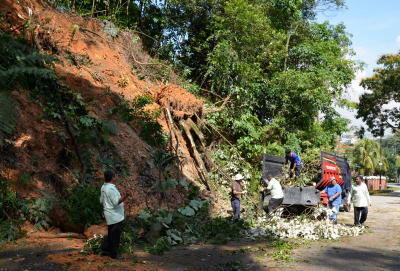 “Several landslips at Bukit Gasing brought down trees and rocks while a river of mud flowed down to Jalan 5/60 recently. It is a disaster waiting to happen. “The landslips are also an indication of the dangerous condition of the area,” said Kamar. MBPJ had determined that the temple building was unsafe and should be demolished. The structure has large cracks and the roof is tilted. Petaling Jaya mayor Datin Paduka Alinah Ahmad had made several visits to the area and instituted immediate measures, such as earthworks to strengthen the slopes in two areas where tarpaulin sheets were used to cover the bare terrain. U-shaped box drains are being constructed, costing RM1mil in total. Alinah said the council’s Engineering Department had suggested nail soiling as a long-term measure, along with building a network of slope drains that would cost RM3.2mil. Kamar said although residents appreciated Alinah’s prompt action, the measures instituted were not enough. They want earth movement sensors brought in to monitor the shift in soil and water-log in order for proactive measures to be taken. “We also want the demolition of Sivan Temple to be carried out in a professional manner,” he said. Petaling Jaya Selatan (PJS) Wanita MCA division deputy chief Datin Wong Fong Leng, who visited the landslip site in Jalan 5/60 on Thursday evening, said more efforts were needed to strengthen the slope. “Motion sensors must be brought in to monitor soil movement but this has not been done. “Work to build gabion walls has also not begun. Work is being carried out at a snail’s pace,” said Wong. She added that the council should bring in geo-technical engineers to review the terrain and find the best method to drain rainwater effectively. On Feb 25, StarMetro reported Alinah as saying that the temple structure was in danger of collapsing as further rains could weaken its soil strength. She said the council had obtained a court order to demolish the temple in the best interest of the people — to protect the lives of devotees, people living at Fraser Towers and the school’s students. It was also reported that Sivan Temple interim committee chairman T. Maharathan had applied to MBPJ for the building to be demolished urgently. “Our consultant, Materials Testing Laboratory Sdn Bhd, carried out a thorough check on the structure and gave us four volumes of the Dilapidation Survey report which recommended that the temple be demolished,” he said. Maharathan has made the report available to MBPJ and the council had given the committee the nod to bring in their own contractors to carry out the temple’s demolition. 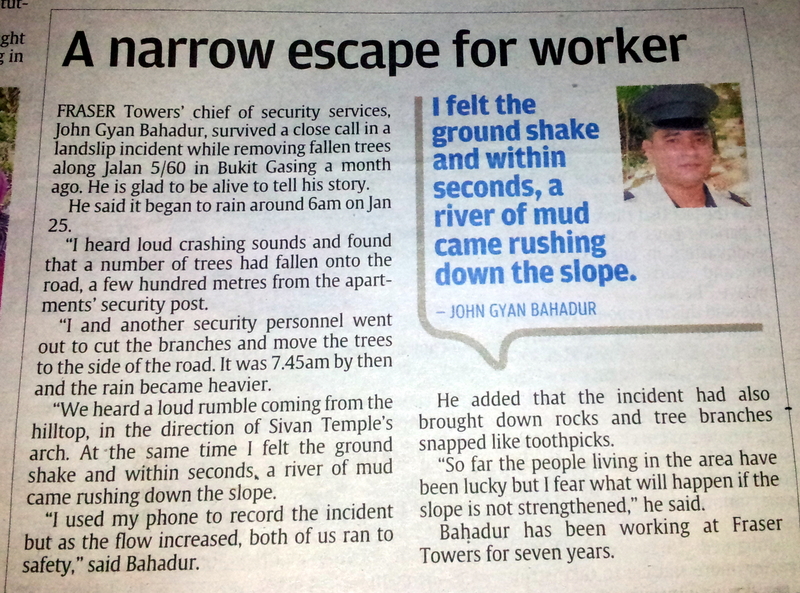 FRASER Towers’ chief of security services, John Gyan Bahadur, survived a close call in a landslip incident while removing fallen trees along Jalan 5/60 in Bukit Gasing a month ago. He is glad to be alive to tell his story. He said it began to rain around 6am on Jan 25. “I heard loud crashing sounds and found that a number of trees had fallen onto the road, a few hundred metres from the apartments’ security post. “I and another security personnel went out to cut the branches and move the trees to the side of the road. It was 7.45am by then and the rain became heavier. “We heard a loud rumble coming from the hilltop, in the direction of Sivan Temple’s arch. At the same time I felt the ground shake and within seconds, a river of mud came rushing down the slope. “I used my phone to record the incident but as the flow increased, both of us ran to safety,” said Bahadur. He added that the incident had also brought down rocks and tree branches snapped like toothpicks. “So far the people living in the area have been lucky but I fear what will happen if the slope is not strengthened,” he said. Bahadur has been working at Fraser Towers for seven years. Watch the landslide Video here…. PETALING Jaya City Council (MBPJ) has obtained a magistrate court order to demolish Sivan Temple in Bukit Gasing after a council report recommended it to be torn down as it posed an imminent danger to people’s lives and properties in the surrounding area. Petaling Jaya mayor Datin Paduka Alinah Ahmad said the temple building was in danger of collapsing as further rains could weaken the soil strength. A slope failure could trigger a major landslide that would see earth coming down on Jalan 5/60, close to Fraser Towers apartments. “Landslides had occurred of late. Now, Sivan Temple is in imminent danger of collapse. “MBPJ has to take immediate steps to eliminate the danger,” she said. The mayor stressed that the court order was requested “in the best interests of the people, to protect the lives of devotees, people living at Fraser Towers and the students of SMK Taman Petaling that is located below the apartments. “The council’s legal department has served the court order to the chairman of the interim temple committee, T. Maharathan, and solicitors of Datin Seri Indrani Samy Vellu. “Both parties have been informed about the demolition exercise. “We respect the religious sensitivity and have given full responsibility to the temple committee to handle the demolition exercise. “But before it is done, MBPJ’s Buildings Department must be briefed on the methods of demolition to ensure no untoward incidents,” she said. She added that the seriousness of the Sivan Temple issue was brought up at the Selangor Economic Action Council and at the state exco meeting on Feb 13. The MBPJ engineering department had taken into account Maharathan’s proposal to demolish the temple based on safety concerns and had agreed to it. Alinah said the council would assist and was willing to offer advice if required. 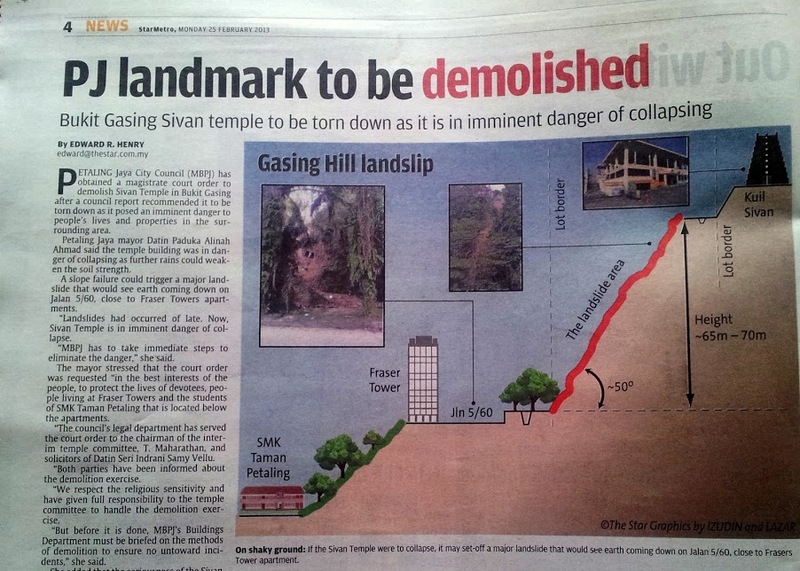 “We assure the committee and devotees that the land on Bukit Gasing remains for the Hindu temple. “For the new temple, building plans must be submitted and our officers will facilitate the process,” she said. On Feb 1, StarMetro highlighted that the concrete roof of the Sivan Temple had tilted and more cracks were visible. Sculptures of huge deities, a cow and the ornate tower on the roof of the two-level building had tilted and Maharathan had said he was worried the temple would collapse in view of the rainy spell. After several landslips along Jalan 5/60, Alinah visited the area early this month and instituted immediate measures such as earthworks to strengthen the slopes in two areas where tarpaulin sheets were used to cover the bare terrain. U-shaped box drains had also been constructed, costing about RM1mil. Alinah said the council’s engineering department had suggested nail soiling as a long-term measure, along with building a network of slope drains that would cost MBPJ RM3.2mil. 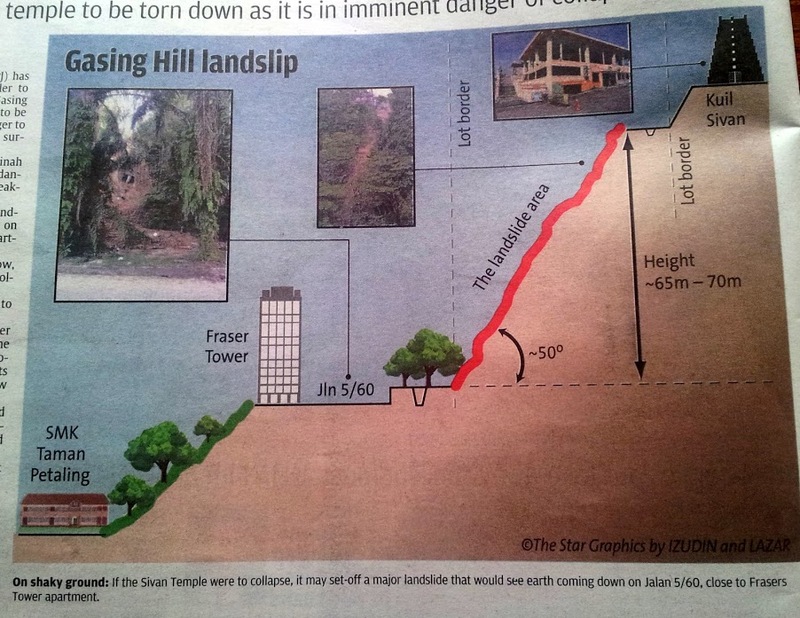 PETALING JAYA: RESIDENTS fear the lackadaisical attitude of the Petaling Jaya City Council (MBPJ) towards the protection of the hill slope of Bukit Gasing may invite catastrophe. Derek Fernandez says excuses about the slow tender process and other reasons for not monitoring the landslide area and taking interim preventive measures are unacceptable. The concern was conveyed by councillor Derek Fernandez during the council’s full board meeting on Thursday. He said the council failed to play its role to ensure the hill slopes affected by the landslide on Jan 25 were well monitored, especially after the incident. Fernandez said the area affected by the landslide, which is on private land, may still pose a danger to neighbouring areas if it’s not attended to. “There were uprooted trees, and drains clogged with mud from the soil erosion. “Tarpaulin sheets were also not placed on all areas of the affected site. “Excuses about the slow tender process, and other reasons for not monitoring the situation are unacceptable. “Disaster will strike when we least expect it. We are lucky to have been given warnings,” he said, adding that interim preventive measures, well supervised by those with the expertise, must be taken soon. Fernandez also urged for more consideration for neighbouring residents such as those living at Fraser Tower. He added that the landowners must be held responsible for the failure to safeguard their areas. 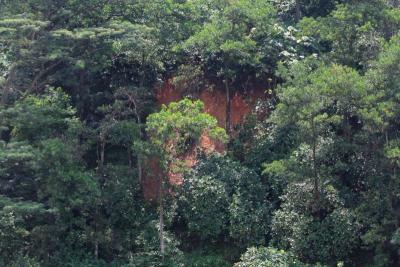 An earlier report by the Minerals and Geoscience Department Malaysia revealed that Bukit Gasing has the “Kenny Hills formation”. This means the hill consists of rock and not reclaimed soil. The findings were highlighted at the full board meeting. Mayor Datin Paduka Alinah Ahmad said recently she would make a site visit soon. “All respective department heads must go to the site and see what needs to be done. “If funds are lacking, inform me and the problem will be addressed,” she said. A Streets visit after the full board meeting saw workers clearing the site. Saya bersama YB Hannah Yeoh dan saudari Kasthuri Patto sewaktu sidang media bersama penduduk Maxwell Towers di Bukit Gasing. Para penduduk risau akan kejadian tanah runtuh yang makin kerap berlaku akhir-akhir ini. More Landslide on Bukit Gasing: On Jalan 5/60; PJ. Photo of Jalan 5/60 after the heavy rain on 25th.January 2013…. At the foot of the landslide, looking up the slope towards the Sivan temple. 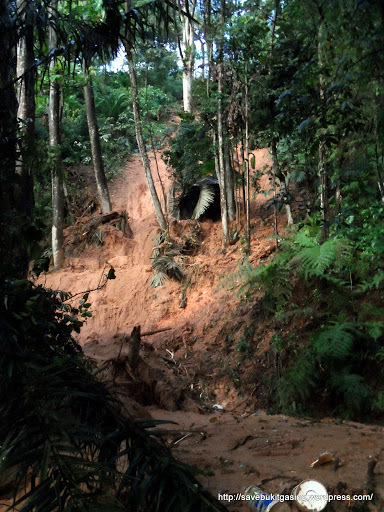 This is another section of the slope below Sivan temple which collapse onto Jalan 5/60…. Close up of the Sivan temple structure and the base of the telecom tower…. 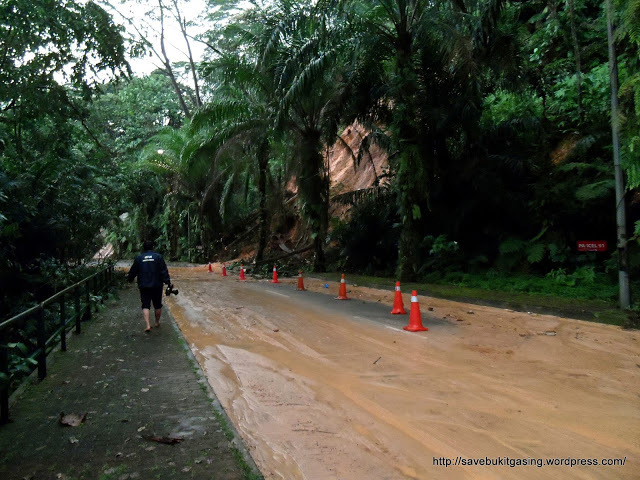 Bukit Gasing, 25 January 2013 – Another series of landslide hit Bukit Gasing along Jalan 5/60, Petaling Jaya after the heavy rain this afternoon. 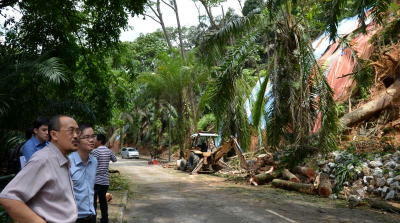 Jalan 5/60 was block by fallen trees. Landslides on 2 sections below the Sivan temple.